This demo shows how cloud services can be leveraged for monitoring energy consumption in domestic or industrial environment. We have used Multi-function panel meter capable of measuring parameters like AC Voltage, Current, Power, Frequency, Power Factor and Energy which can be accessed via MODBUS (RS485) interface. 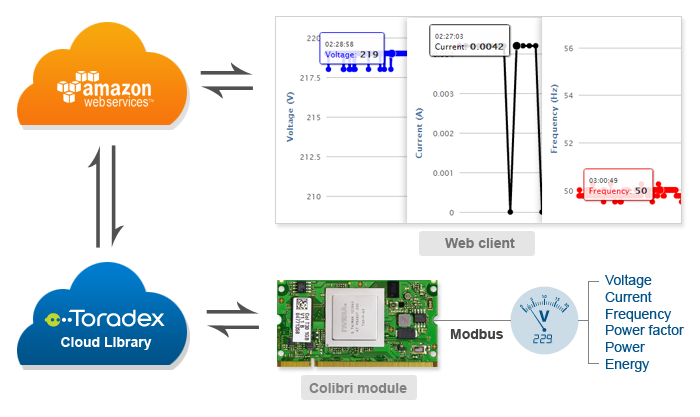 Colibri module is fetching the parameters periodically from the meter and sending it to the Amazon RDS MySQL database table using Cloud library, which then is retrieved by webpage and displayed in the form of table and graphs. This kind of solution enables analysis of the various parameters, which can then be used to make decision on how to make efficient use of energy. Real world applications are Energy Monitoring, Load monitoring and control, etc.